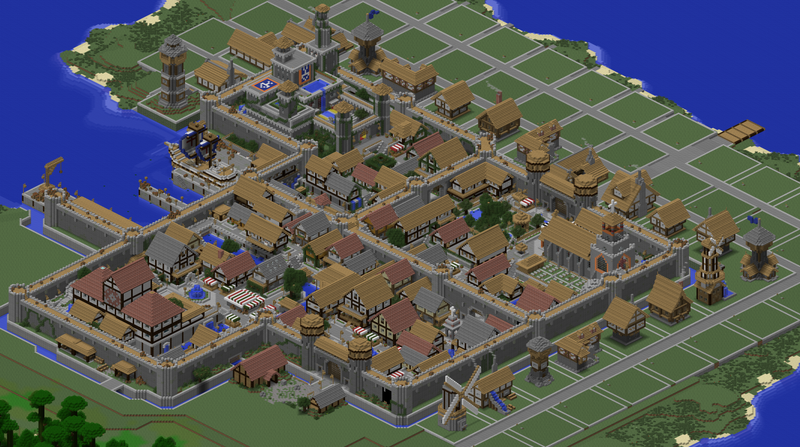 Pirates and Cutthroats is a medieval themed Pirate raiding and farming server. Team up, set sail using MoveCraft, raid farms or build your own. The fortress has shops to sell your crops as well as other shops with dynamic prices to buy and sell many different items. At these shops the prices will drop as the more players sell and increase when players buy from them. The fortress is large and offers many avenues for adventure, so make sure you take your time looking around and familiarizing yourself with all the areas. Want to a house in the fortress, explore and pick the one that you like. When you are ready to start your adventure, leave the city and start building your base and farm. Numerous commands are documented in the castle to help you get started. There are 35 basic ranks and 35 royal ranks for the top ten players. No exploiting: bugs, glitches, or loopholes. Please report with /ticket. Permitted Add-ons: Optfine, Mapwriter (use Opis for 1.7.10), Not Enough Items (for recipes), ArmorStatusHUD, DirectionHUD, StatusEffectHUD. Chat Moderators are able to play the game like a regular player rank up, grow crops, etc. Chat Mods are expected to not be biased and be a neutral player when it comes to wrong doings in chat. When online, Chat Moderators need to be assist players to the best of their ability, and monitor chat. Below, you will be able to find all of the chat rules, and their punishments. Chat Mods are required to warn users if they infringe on any of the rules. All Chat Mods are required to be in the top ten players with regards to points from playtime, voting, and referrals; therefore, only players with Royal Ranks can be Chat Mods. News and server changes will be posted at the end of the thread as it occurs. Everyone please remember to vote. The rewards are amazing. The items that are meant to be farmed are: Melons, Carrots, Potatoes, Cooked Pork, Grilled Beef, Cooked Chicken, Pumpkins, Oak Wood, Sulphur, Bones, Arrows, Cactus. Though they are still working on the server, this server is pretty nice. I now made it to the 3rd rank and i am really enjoying the market and economy of this server. Here's a little tip from my time of staffing on servers. Instead of posting things as a reply to your own forum post, simply edit the original forum post, as many people will not know to look through the forum replies for the links. Also, I am unaware if you have one yet or not, but a /vote command would definitely help in the voting department. Once again, goodl uck on your server, I don't have enough time to play it myself, but it looks like quite a good server. I decided to post the links as a reply so anyone who was subscribed would get notified that there was some new information available. I just kept forgetting to add the voting links into the original post. Also ever since we added the voting, /vote has been available. If you ever get time, please stop by. Make whatever you are doing fun. For anyone who is wondering, the 70 rank are amazing. You get something at each rank and sometimes more then one thing. Why do you think you should be chosen as a Chat Moderator? : To be honest there isn't a reason why you should chose me instead of someone else, so if you pick me then thanks. If your friend, or someone from your clan said something racist in chat, would you give him the same punishment as you would someone you don't like? : yeah i would still mute them.. that would be showing favoritism..
Have you ever been banned or muted, if so, how long and what was the reason(s)? : Nope, not once. Why do you think you should be chosen as a Chat Moderator? : I'm very active in the community and I would like to keep respect among the players. If your friend, or someone from your clan said something racist in chat, would you give him the same punishment as you would someone you don't like? : Yes, of course. My friend would understand that he's impacting the community in a negative way, and would need to be dealt with justly. Have you read and understand all of the rules? : Yes. Have you ever been banned or muted, if so, how long and what was the reason(s)? : No. I don't think so. I don't want to lie though so I will explain. Your spam filter, is quite frankly over sensitive. I have never been muted by a player. Nor have I ever been banned. For some reason typing a sentence like this can get blocked. So, the answer you are looking for is probably no. Why do you think you should be chosen as a Chat Moderator? : I care. If a human could possibly care too much, it would be me. I don't think it is hard to see my dedication. I lead a busy life but when I do get time to play Minecraft it is spent on your server. I always want to help someone, someway. I don't just say that. I truly go out of my way everyday to make someone elses day just a little better. I don't think I should be chosen because I've known you for a long time, but I do think it is something worth noting. You have known me from various servers over the past few years. You have gotten the chance to observe me and I think you know that I have never abused my staff position on servers. Also, it gives you the chance to just get to know me as a person. I want people to be nice to one another, then again- maybe I expect too much. If your friend, or someone from your clan said something racist in chat, would you give him the same punishment as you would someone you don't like? : It kills me to punish anyone. I pride myself on my communication skills. I would love to talk a player through what they did wrong and tell them to never do it again. People make mistakes, and people deserve second chances. Of course some people repeatedly break rules and or do it severley, then they have to be punished. Oh, racist, yes. I should have read the question more thourghly, I do not tolerate racism/discrimination of ANY kind. That is how I work, don't like it- don't give me moderator powers. You share your prejudice thoughts in chat, you will be muted if I am online. That is something you should know. Anyways, I've been there done that with the friends situation on multiple servers and in real life. I've had to kick my friends out of the grocery store I work at, why my manager told me to do it, I don't know but I had to do it. What makes you stand out in the community in a positive way? : I care, a lot. I like to interact with the players. I help new players out. Any additional information? : Not really. I have enjoyed playing on the server and will continue to. See you all around. Thank you for taking the time to read my application. I look foward to the opportunity. Ben_J_H you have been accepted as a Chat Mod. Please contact an admin in game to receive your rank. Server host is experiencing problems. We are told that they are working to correct the problems.